Once a favorite of the ruling class, this flower is now endangered. Sometimes, it seems like orchids are the snowflakes of the botany world. Though these flowers bear some similarities—all of them poised in their fragility and charmingly irregular—no two are quite alike. They exist as limited-edition masterpieces, whose beauty is largely inaccessible due to their cost. For hundreds of years, orchid breeders have been dedicated curators: They cultivate their crops in nurseries under near-neonatal care. One orchid species, the Neofinetia falcata, has a particularly distinguished history as the first orchid to be grown as a houseplant in Japan, marking the birth of a new art form. 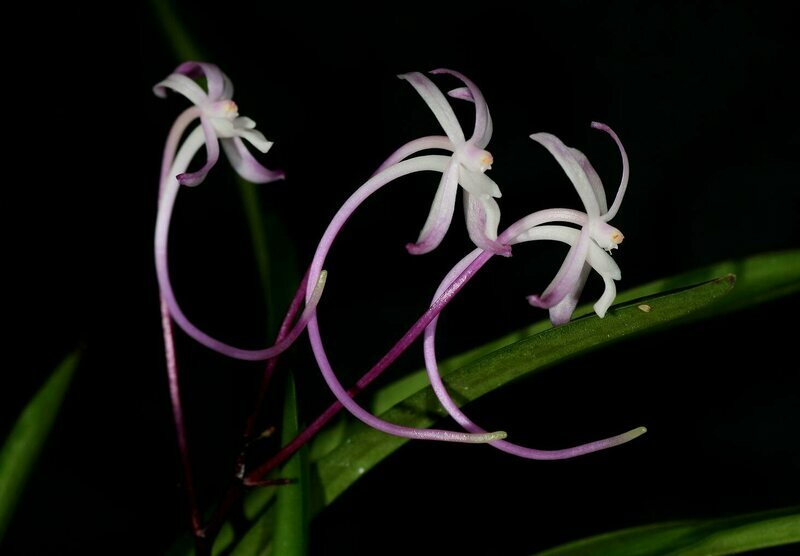 But today, Japan’s Ministry of Environment considers the jasmine-smelling Neofinetia falcata (along with over 70 percent of the country’s other native orchid species) critically endangered, making its value even greater. In the 17th century, Japan’s Edo period, Shogun Tokugawa Ienari became smitten with the Neofinetia falcata. This delicate orchid, endemic to the high mountains of Japan, was celebrated for its strong fragrance, activated at dusk. When found in the wild, these flowers were called “furan,” meaning “wind orchid.” Ienari was the eleventh and longest-serving shogun (or military dictator) of Japan, so his obsession quickly became a marker of cultural cachet. As a result, the wild furan became the upscale “fuukiran” meaning “orchid of wealth and nobility.” In line with the elitism of the fine-art world, the prestige of particularly outstanding orchids became a symbol of class. For a time, samurai were the only people permitted to grow the Neofinetia falcata (which spurred the nickname “samurai orchid”). Feudal lords seeking to impress the shogun would gift him the powerful plant and usually get their own estate in return. The preciousness of the Neofinetia falcata was further cemented by aesthetically focused cultivation techniques, which gave way to a new era in Japanese cultural arts. In the homes of the ruling class, these orchids were displayed behind protective nets of gold thread and visitors had to cover their mouths with calligraphy paper to shield the flowers from their germs. Mounting and planting these epiphytes (organisms that grow on top of other plants) in traditional hand-painted, clay-fired pots became an art form unto itself. But beyond the overall aesthetic of the orchid’s composition, their flowers brought beauty to a space, too: The color of these orchids varies from linen white to raspberry, and their flowers reportedly smell of vanilla and coconut. 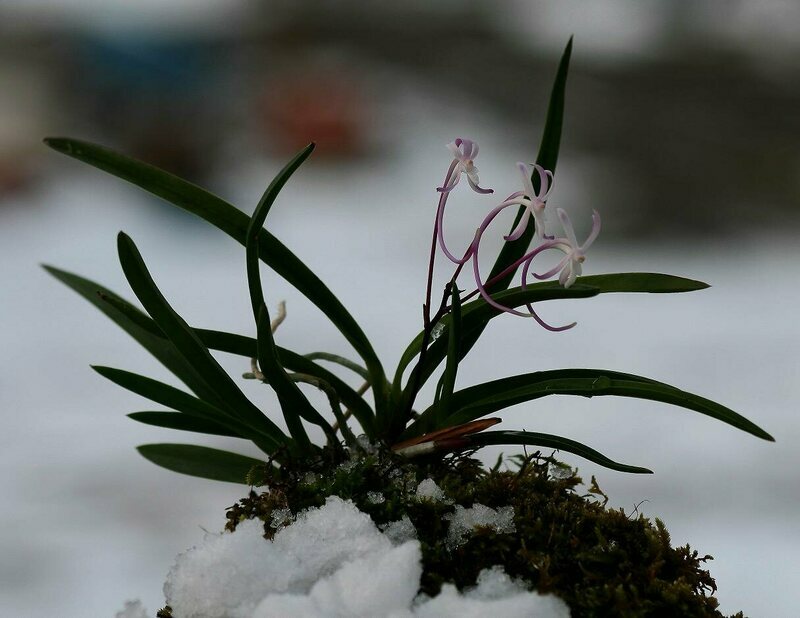 Several hundred years after the shogun’s Neofinetia falcata campaign, the French botanist Achille Finet, who specialized in studying native Japanese and Chinese orchids, discovered this orchid was distinct from another plant genus found earlier. In 1925, Hu Xiansu, a pioneering Chinese botanist and plant taxonomer, named the orchid genus “Neofinetia” in Finet’s honor. The scalloped, variegated edges of orchids post-bloom illustrate their differences, yet the process of growing them is meticulously standardized. Joan Didion memorialized the artistic attention paid to the orchid life cycle in her 1979 essay “Quiet Days in Malibu” writing: “The silence in the greenhouse would again be total. The temperature was always 72 degrees. The humidity was always 60 percent.” This process of pursuing environmental perfection not only grows the plant, but grows the orchid breeder’s appreciation of the plant in kind. The Japanese viewed the Neofinetia falcata as living pieces of fine art, and so their cultivation of them was artistry. 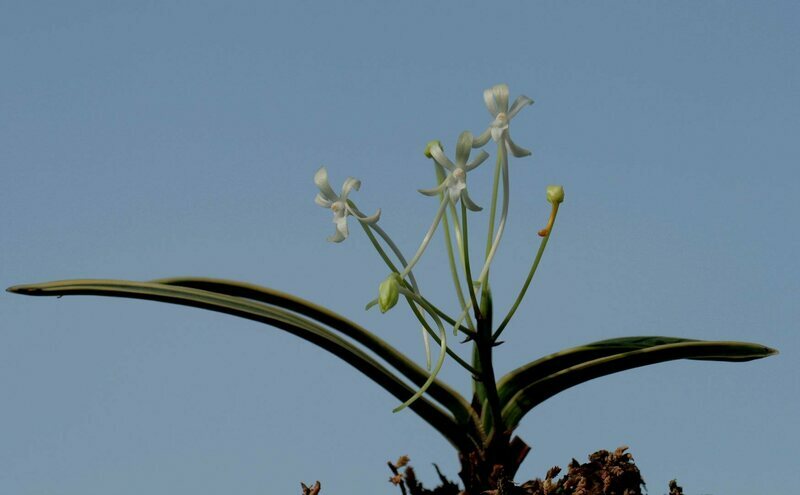 Today, Neofinetia falcata are found most commonly across southeastern China, South Korea, Japan, and the Ryukyu Islands. Breeders keep these orchids damp to mirror the flowers’ natural environment from spring until fall (their growing season), as they like to soak up the stretching sunlight and thrive atop a throne of sphagnum moss which looks like a velvet green anemone. In Japan, the warm, wet monsoon season during June and July encourages the bulbs to bloom, and is promptly followed by a cool and icy winter when the orchids lie dormant. At a Japanese auction in 2005, bidders paid up to $70,000 for a rare Neofinetia falcata variety, cementing the plant’s status as a work of art for the home akin to a famous painting or first edition manuscript. Registering and ranking fuukiran is handled by the official Japanese Fuukiran Society and permission to grow this exclusive orchid is by invitation only. Considered the “perfect orchid” thanks to its history as a Japanese shogun’s prized plant, these flowers occupy homes as living botanical paintings.